The RGB LED is situated at the bottom Codey&apos;s face panel. Codey&apos;s RGB LED consists of 3 LEDs, namely red LED, green LED, and blue LED. You can get different colors by controling brightness of each LED. At the center of Rocky&apos;s Color IR Sensor is the RGB LED, which consists of 3 LEDs, red LED, green LED, and blue LED. By lighting on or off each LED, you can get seven different colors. Light up Codey&apos;s RGB LED a specified color for a specified period of time. Press Button A, Codey&apos;s LED will light up red, and light off after 1 second. Light up Codey&apos;s RGB LED a specified color. Press Button A, Codey&apos;s LED will light up red. Set the specified LED indicator with specified color value. There are three LED indicators: red, green, and blue. Change the color value of one LED indicator will not affect the color value of the other two LED indicators. Press Button A, Codey&apos;s RGB LED will light up yellow. Turn off Codey&apos;s RGB LED. 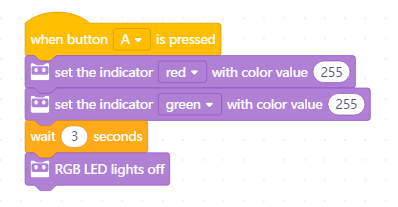 Press Button A, Codey&apos;s RGB LED will light up yellow, and light off after 3 seconds. Set Rocky&apos;s RGB LED a specified color. There are seven colors: red, green, blue, yellow, cyan, purple, and white. 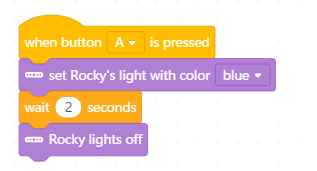 Press Button A, Rocky&apos;s RGB LED will light up blue. Turn off Rocky&apos;s RGB LED. 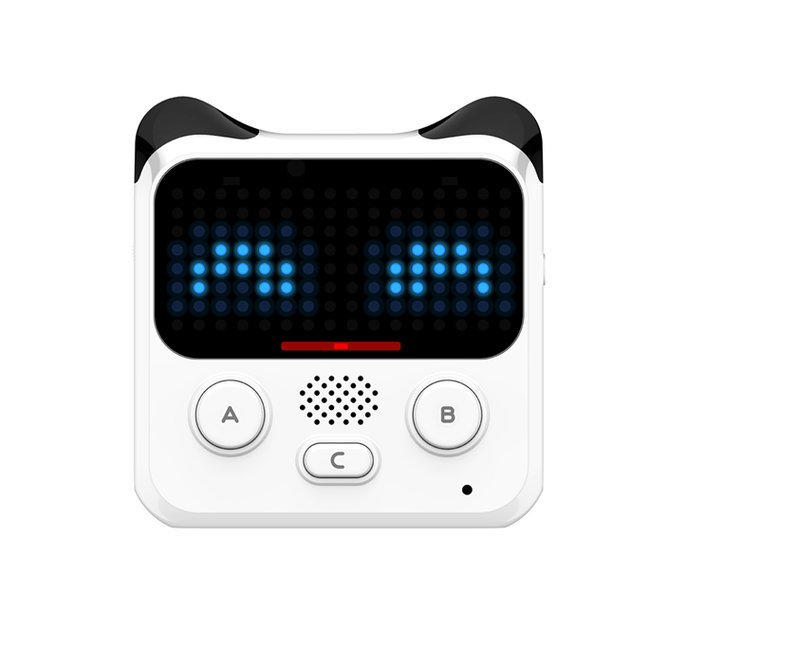 Press Button A, Rocky&apos;s RGB LED will light up blue, and light off after 2 seconds.